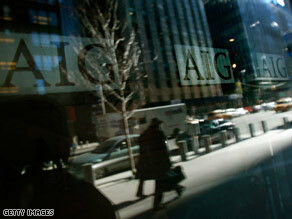 Analysis: Who didn't know about AIG bonuses, and why not? WASHINGTON (CNN) -- Treasury Secretary Timothy Geithner says he didn't know "the full scale" of AIG's retention bonuses until March 10, but it wasn't because anybody was trying to keep the $165 million payments secret. A day before congressional hearing, AIG detailed $492 million in retention payments for "key employees." In fact, the company reported the plans in filings made in September, CNN reported on the plans in December and January and Geithner himself answered a question that mentioned the bonuses during a congressional hearing on March 3. At a House Ways and Means Committee hearing, Rep. Joseph Crowley, D-New York, ticked off a number of bonuses AIG had already paid and planned to pay -- including the bonuses that went out last week -- in a lengthy question that included multiple dollar figures, numbers of employees and dates. Finally, he said committee wanted to work with Treasury to create "tough commonsense compensation limits" that would include voiding upcoming bonuses and recouping money from those already paid out. Geithner responded that compensation in financial institutions had gotten "out of whack" in recent years, adding that government had a role in changing "basic incentives ... to make sure this kind of crisis doesn't happen in the future." "The judgments made by these boards of directors and senior executives across parts of the financial -- have just caused a lot of damage to public confidence in the quality of their judgment, and they have a deep responsibility and obligation to make more careful judgments going forward, but we're not going to be able to depend on them to do it," Geithner said. "We're going to make sure there's conditions that come with our assistance to assure that." But, Geithner said, any new provisions the government came up with would have to be "as carefully designed as possible," so that AIG can operate and restructure responsibly. It was his only mention of AIG in a response that was longer than Crowley's question. Geithner told CNN on Thursday that he was "informed by my staff of the full scale of these specific things on Tuesday, March 10." He added: "As soon as I heard about the full scale of these things we moved very actively and explored every possible avenue, legal avenue, to address this problem." But plenty had already been written -- and spoken -- about AIG's "retention payment" plan before March 10, and before the March 3 hearing. "This amount also includes awards to AIGFP's employees under its retention program, which was established in the first quarter of 2008 due to the declining market environment, to manage and unwind its complex business." As the company's single largest stockholder, you might think the government would know exactly what AIG was obligated to pay it's executives. After all, all Treasury officials had to do was turn on the TV. Here's CNN's Joe Johns' report from December 11 of last year, filed four months before Geithner says he became aware of the magnitude of the problem. "A Wall Street riddle -- when is a bonus not a bonus at all? Answer -- when it's something called a retention payment. Insurance giant AIG which just helped itself to a $150 billion bailout from the government promised not to pay bonuses to its top 60 executives because taxpayer money is on the line. But then the company turned around and offered 168 of its top people huge payout if they promise to stick around for a year." And here's CNN's Mary Snow, in a report filed at the end of January. "American International Group is paying bonuses to its Financial Products Unit. That same unit racked up huge losses. A source familiar with the matter puts the figure at $450 million. The company isn't saying exactly how the money will be paid out, but if evenly distributed, it would average roughly $1 million per employee." Numerous print publications -- including in New York and Washington -- also reported on the retention payments long before Geithner says he became aware of the scale of the problem. And Geithner was the chairman of the New York Federal Reserve last fall when Treasury, the Federal Reserve in Washington and the New York Fed worked on AIG's original bailout. CNN's Steve Turnham and Kathleen Johnston contributed to this report.